Burning fat is about much more than exercising and cutting back on fat. What you eat and how you eat are extremely important, and actually, cutting back too much on fat and over-exercising can backfire. When it comes to the food-part, most people think burning fat is only about cutting back on certain foods and “dieting”. But actually, there are many foods that you can ADD to your diet, that have awesome fat-burning qualities which can help you a lot more than starving yourself. Plus, eating “fat-burning foods” can help you stabilize your blood sugar (so helping to prevent diabetes) and boost energy levels. What do we need in order to burn body fat? Muscle. A fast metabolism. Stable blood sugar. Balanced hormones. Regular appetite (ie. If we’re always stressed and/or always hungry, it’s hard to burn fat). So basically, you want to be eating foods that: help you build LEAN MUSCLE, boost your metabolism, promote a sensation of satiety/fullness so that you don’t overeat, reduce sugar cravings, and that help stimulate your digestion, so you quickly eliminate what you don’t need. Chia Seeds. Rich in omega-3 fatty acids and plant based protein, Chia seeds help fire up your metabolism, increase energy and give you more endurance (making them a great pre- and post-workout snack). 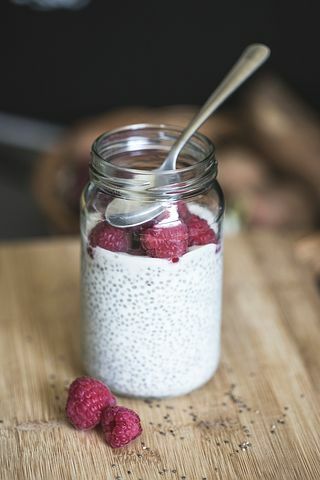 Chia seeds also trigger the release of glucagon, a “fat-burning" hormone, and help suppress hunger and sugar cravings, partly due to its ability to absorb so much water and make you feel full. TIP: The more these seeds soak up liquid and grow in size, the quicker your stomach releases the hormones that give off a signal that you’re full – so you’re best off consuming as chia pudding! Leafy Green Vegetables. Leafy dark greens like kale, spinach, collard greens and Swiss chard are incredibly nutrient-dense, filled with iron, and have high amounts of protein for veggies. These greens help keep muscles functioning properly, so they can keep burning calories after your workout! They’re also packed with vitamin K, which keeps bones strong. Additionally, they help your liver to eliminate toxins, and a body with less toxins means fewer cravings for foods that make us fat, like sugar! Kefir and Yogurt (natural, and preferably vegan). The PROBIOTICS in these fermented foods help regulate your gut to get rid of bloat. They also help boost your metabolism to burn fat. Because dairy can be inflammatory for some and difficult to digest, my preference is for vegan probiotic foods, for ex. coconut milk yogurt and coconut water kefir (AND you'll benefit from the added metabolism-boosting and gut-friendly properties of coconut). Ghee and Coconut Oil. Yes, they’re fats that help you burn fat! Both Ghee and Coconut oil are rich in MCTs medium chain triglycerides – a type of fat that your body quickly uses for energy leaving less opportunity for them to be stored as fat. Both also have a higher smoke point, so are great for higher heat cooking (use for baking/roasting/or any high heat cooking in lieu of inflammatory oils, butter, or even your extra-virgin olive oil which can lose its beneficial properties with very high heat). Wild fatty fish, primarily salmon, tuna and sardines. A diet rich in omega-3s can boost heart health, lower risk of mental disorders like dementia, improve mood, and more. As for fat burning, protein-rich omega-3 sources such as wild salmon and tuna, help keep you full and can improve your insulin sensitivity to burn more fat. Plus you burn a lot of calories while digesting the protein! (And FYI, wild fatty fish provide EPA and DHA, direct sources of omega-3 that don’t need to be converted as is the case with seeds, so it’s a quicker supply of the fat that helps you burn fat). Avocados. The monounsaturated fat in avocados fattens up the cell membranes and sends a message to switch ON your body’s fat-burning hormones, and switch OFF your fat-storing hormones. Adding some avocado to your meal will help keep you full, and your cravings at bay. Avocados also contain a type of carb that slows insulin release and boost calcium absorption, both of which encourage fat burning. Lastly, an average hass avocado contains 4g of protein, not a ton, but it contributes to those fat-burning muscles. Apart from these awesome 6 foods that you should include in your regular diet, there are 2 other things that I find help a lot: 1) small amounts of green tea (especially matcha, being more pure, more antioxidants, more everything!) and 2) "fat-burning spices", mostly cayenne pepper, turmeric, ginger and cinnamon, which are extremely easy to add to all of your foods! Green tea. First, green tea contain properties, mostly “catechin polyphenols” which are thought to stimulate fat oxidation and increase fat metabolism. Also, the caffeine in green tea stimulates adrenaline which sends a message to your fat storage to burn fat. When you drink before a work out, it can help you work out more intensely. However, be smart about caffeine. More than one per day can interfere with your hormones, in particular, with your body’s ability to regulate insulin - a hormone which promotes fat storage! Cayenne pepper (and other hot peppers) contain “capsaicin”, a compound that heats up your body, boosts your metabolism, and helps you burn additional calories. Turmeric decreases inflammation throughout your body, including fat cells. Ginger also helps reduce inflammation, boost digestion, increase blood flow to muscles and aid in muscle recovery post workout, also aiding in fat burning. Cinnamon helps keep your blood sugar stable by moving glucose into cells faster; this means there is less insulin hanging around (and again, insulin is what tells your body to store fat). To reap the benefits, it's suggested that you should consume 1-2 teaspoons every day. Add it to your smoothies, your chia pudding, your desserts, your lattes, etc. What now? To optimize your fat-burning, aim to include at least 3 of these 6 fat-burning foods EVERY SINGLE DAY. And YOU KNOW those green leafy veggies should ALWAYS be included, every day! Plus, sip on a delicious matcha green tea before your morning workout, and sprinkle one or more of these fat burning spices on your meals. Think... chia pudding with cinnamon, and avocado toast with cayenne pepper.... so yummy and double the fat-burning! And of course, don’t forget all of the factors that play a huge role in burning fat, including minimizing the bad fats and doing fat-blasting exercises like BARRE.